Ohio Department of Natural Resources Wildlife Division Officer Chris Gilkey and K-9 Officer Maddis, of ODNR District 4, are one of three initial K-9 units for the new ODNR Wildlife Division program. The dogs will be used to track lost hunters and hikers, as well as assisting in poaching and illegal activity in the harvesting of ginseng root. LIMA — A new breed of wildlife officer will soon be joining the Ohio Department of Natural Resources Wildlife Division ranks, with three K-9 units set to begin work after finishing their 10-week training program in Columbus. Matthew Leibengood is one of five ODNR Wildlife Officers, each covering a different district, chosen to be a K-9 handler. Leibengood and his Black Labrador retriever partner, May, are District 2 wildlife officers, he said. The other two K-9 teams consist of Chris Gilkey of District 4 and German Shepherd Maddis as well as Jeremy Carter of District 3 with German Shepherd Finn. 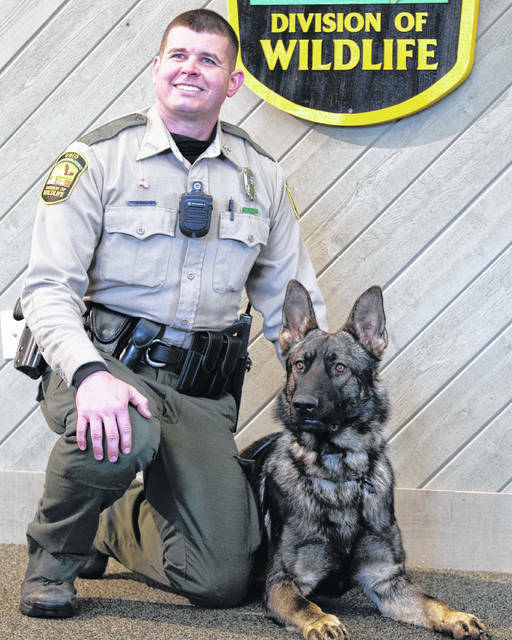 K-9 units have been active in the ODNR Parks and Watercraft Division for some time, said Jason Lagore, Division of Parks and Watercraft and ODNR’s K-9 trainer. The dogs will be trained to recognize and respond to five different scents — deer and turkey, water fowl, certain fish species, ginseng and gun powder. Reacting to the different animal scents would assist wildlife officers in poaching investigations. The dogs would be able to track down any animals parts suspected poachers are attempting to hide. Ginseng is a rare, profitable item, and there are people out there who don’t follow the regulations set in place to keep ginseng harvesting in check, Leibengood said. Ginseng needs to be a certain age before harvesting, there is a harvest season and handling requirements for it and harvester needs permission to enter private property. A trained K-9 unit could track the scent and find the hiding places, making it possible for wildlife officers to make arrests, he said. The dogs will also be used to track lost hunters and hikers. Only the best of the best dogs are chosen, said Lagore. ODNR normally purchases pure breed dogs from professional breeders because they are looking for certain traits for certain jobs. For example, when they are looking for dogs that will be used for suspect apprehension, they don’t choose a Black Labrador because they don’t have the required bite strength and body mass to perform that duty well. Instead, they look for dogs with powerful bite strength and body mass like German Shepherds or Malinois, a breed that can knock suspects down using their speed. Breed is not the sole factor in choosing K-9 dogs. The dogs must have steady nerves. Potential dogs are tested through exercises like walking up and down glass stairs, checking their reaction to sudden, loud noises and observing their self-control when biting a shirt, according to Lagore. “You can take two champion dogs, breed them and when they have a litter of puppies still only get two K-9 dogs out of the bunch,” he said. Lagore said the handlers have to be a special kind of person, too. They want people who have experience with dogs and are not afraid of them. Lagore said being a K-9 handler is like riding around all day with a two-year-old in the back seat. The dog is going to get sick, have accidents and will need food and water. Reach Bryan Reynolds at 567-242-0362.